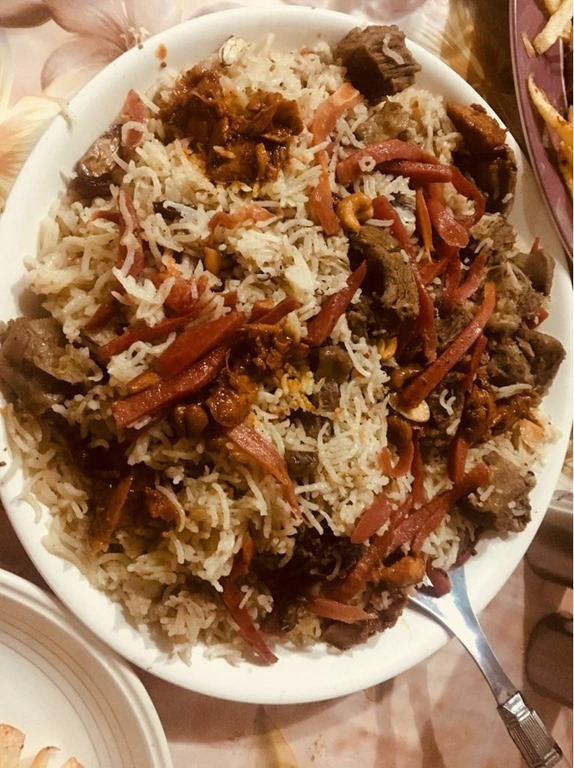 Kabuli pulao is also known as Afghani rice. I ate this at my cousin’s place and I loved it. The taste of carrots and raisins on top of rice enhances the flavor of the whole dish. Best ever recipe from Afghan cuisine. Heat 1/2 cup oil in a pan, add 1/2 kg mutton with fat and fry till its color turn to golden brown. Now add 1 glass of water and 1 tsp. salt. Cook over low flame till meat becomes tender. Soak 1/2 kg rice for 20 minutes in water after washing them, cook with 2 tsp. cumin seeds, 1 tsp. salt and water as required till half done.Now drain the rice and keep aside. Now in meat mixture add 2 chopped carrots, 100 gm. raisin, 4 green cardamoms, 1 tsp. black pepper, 2 pieces of cinnamon and 1 cup apricot. Cook for another 1 minute. Now add boiled rice and 1/2 tsp. saffron essence. In another pan cook 2 tbsp. sugar until melts, add 1/2 cup water and mix well. Now pour this mixture on top of rice and simmer for 20 minutes. Serve hot.